By: Lindsay Scharfstein, Ph.D., Victoria Bacon, M.P.S., Carla E. Marin, Ph.D. Selective mutism (SM) is an anxiety disorder in which children do not speak in school, extracurricular or community activities, sports, etc., despite speaking at home or in other settings. Children with SM have the ability to speak, and are often described by immediate family members as ‘chatty’ or ‘talkative’ when observed at home and in other select environments. Despite speaking freely at home, children with SM appear to ‘freeze’ and remain mostly or completely silent in social situations depending on the person, place, and situation or activity. Even subtle changes around them or shifts outside of their comfort zone can lead to drastic changes in (non)speaking. A child with SM may talk loudly and enthusiastically to a parent at home, in the grocery store aisle, and at a restaurant, but may immediately become, and remain, silent when a neighbor visits the home, an adult or peer walks in the same grocery aisle, or a waiter approaches the table to take an order. As known and deeply felt by families who are coping with SM, this pattern of reluctance in speaking greatly impacts the child’s fundamental ability to convey their needs and to engage fully at school, with friends, during afterschool activities, and in their neighborhood and community. It can be healthy and adaptive for children to experience a range of speaking behaviors and to be more reserved around new children and adults, particularly when away from their caregivers. Even the most social and outgoing children can have moments of silence or speaking reluctance without a lasting impact on daily functioning. Of note, developmentally appropriate silence is transient and temporary and these individuals do speak when there is an expectation to speak (e.g., when called on in class or asked by a friend if they want to play). Therefore, we further distinguish children with SM from those without SM as those who have a consistent refusal to speak in specific social situations in which there is an expectation for speaking (e.g., at school), despite speaking in other situations (e.g., at home with family members), and the silence or reluctance to speak has a negative impact on the child’s daily life. Take Our Quiz: Is it Shyness or Selective Mutism? Does your child seem to “freeze up” in certain circumstances and not be able to or not want to speak? Answer a few questions to find out more. Parents, caregivers, teachers, and mental health or medical providers unfamiliar with SM may misperceive social silence as ‘shyness’ or a temporary phase that the child ‘will outgrow.’ As a general guideline, shyness represents an initial experience of reticence that is most likely to occur in new or unfamiliar settings or before an adequate ‘warm-up’ period. A ‘shy’ child without SM may appear quiet during the first half of a friend’s birthday party when unfamiliar peers are present, within the first few weeks of a new school year, or when asked by a teacher to present to a small group or whole class without any notice or time to prepare. 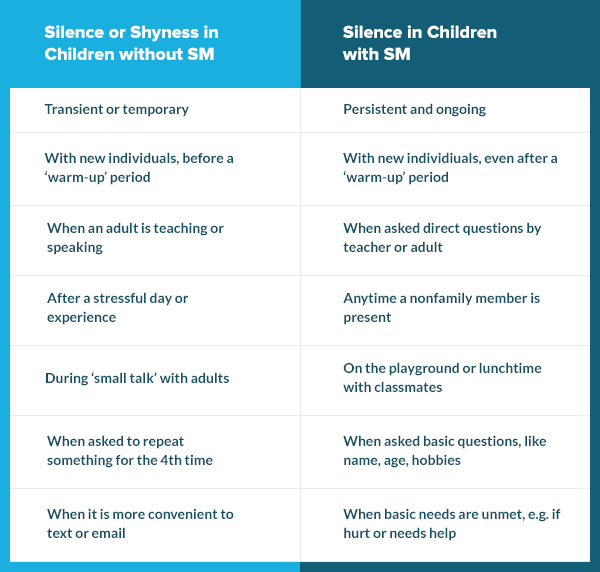 By comparison, a child with SM may continue to remain silent despite extensive warm-up periods, including after multiple playdates with a classmate, years in school with the same peers, or when asked by a friendly peer or adult about their name, age, or favorite interests. SM often impacts a child’s ability to get help, request to use the restroom, or tell others if they are hurt, lost, or in pain. See the table below for side-by-side comparisons. Naturally, adults or children may also mistake selective silence in children with SM as ‘rudeness’ or deliberate attempts to defy others. It is important to recognize that children with SM suffer from anxiety and their silence is most often ‘rooted’ in worry associated with social evaluation or judgment, fear of making social mistakes, and uncertainty about one’s ability to be liked and accepted. Since the difficulties with verbal communication are consistent for individuals with SM, over time they can be labeled as the ‘one who does not speak.’ Further, children with this condition who are not appropriately identified and treated are at risk for the development of social anxiety disorder and other mental health disorders, as well as continuing to suffer from SM as adolescents and adults. This trajectory often leaves individuals and families feeling stuck in a pattern of social silence that greatly influences social, emotional, academic, and occupational health. SM is best understood as an anxiety-based condition resulting in limited verbal communication among individuals, particularly children, who are otherwise verbal in the home or select environments. To diagnose SM, the symptoms of persistent silence in social settings must be present for a least one month, or longer than six months, if it is the first year attending school. The failure to speak cannot be due to a lack of knowledge of, or comfort with, the spoken language required in the social situation. SM is also not an appropriate diagnosis when the failure to speak is due to a primary language or communication disorder or other disorders, such as an autism spectrum disorder. These conditions should be ruled out as needed to make appropriate diagnoses and related treatment recommendations. In addition to persistent reluctance in speaking, children with SM often exhibit stiff body posture and ‘deer in the headlights’ facial expressions, inadequate eye contact, and slowness to respond even when there is a clear preference or answer. Individuals with SM may also experience worries, fears, stress, and physical complaints including aches, pains, or discomfort, reluctance to separate from parents or preferred peer(s), sensory sensitivity, and rigid or inflexible behavior. Within the umbrella of SM, children with this disorder may vary in terms of how they use their voice and body language to communicate with others, ranging from minimal to frequent and appropriate use of verbal and nonverbal behaviors. Beginning with the most limited communication style, some children with SM may restrict nearly all verbal and nonverbal communication in social scenarios. These children may display a tightly closed mouth, minimal eye contact, and have an expressionless face. This pattern of both limited verbal and nonverbal cues can leave others unsure about what these children are thinking and feeling and most importantly, whether they have any unmet emotional, educational, or medical needs. Some children with SM may communicate using only nonverbal communication such as nodding, smiling, pointing, writing, signing, or miming. These children may be able to get many of their needs met by nodding to yes/no questions, pointing to answers in a book, and writing to express their ideas; however, prolonged or sole use of nonverbal communication can increase the reliance on nonverbal measures and decrease opportunities for a child to practice, and gain comfort with, speaking. Other children make sounds and noises (e.g., grunts, mumble, animal sounds) and utterances (e.g., um, uh-huh) instead of intelligible words. Many children with SM will whisper or use an altered voice, such as using a deeper or higher pitched voice, a robot or animal voice, etc. Whispering or using an altered voice often places strain on their vocal chords and requires more effort than their typical voice, yet feels less revealing and anxiety provoking when used. Some children speak clearly and audibly to certain individuals, and in certain places outside of the home, despite the lack of speech in others. Treatments for selective mutism include psychological/behavioral or pharmacological treatments. However, psychological/behavioral treatments are the first line treatments for selective mutism. Children who do not respond to these treatments might benefit from pharmacological interventions. Cognitive behavioral therapy (CBT) is an evidence-based treatment for childhood anxiety disorders, including SM. CBT focuses on teaching children coping strategies (e.g., modifying “thinking traps”), relaxation strategies, and gradually helping children face their fears (i.e., exposure). Using behavioral principles, clinicians employ strategies like shaping, contingency management, and modeling (e.g., Vecchio and Kearney, 2009), with graded exposure being the most effective. The gold standard intervention for SM is behavioral therapy (Wong, 2010). Behavioral therapy has the largest supported research base for SM, and thus is typically the first recommended treatment option. Behavioral therapy aims to reduce anxiety and avoidance, increase speech and other verbalizations, and reduce oppositionality or negative attention-seeking (Cohan, Price & Stein, 2006). Behavioral techniques include shaping, stimulus fading, behavioral exposures, and contingency management (Bergman, 2013; Cohan et al., 2006). Shaping occurs in gradual steps towards the final goal. Parents often use shaping to achieve the goal of riding a bike. Shaping steps may include praising a child wearing bike helmet, standing near bike, sitting on the seat, holding handlebars, riding with training wheels, riding without training wheels while a parent holds the bike, and eventually, independent riding. For children with SM, there can be a huge jump between not speaking and speaking, with steps including relaxed mouth, blowing air through mouth, sounds, speaking in an audible voice volume, answering forced choice questions (‘is this blue or red?’), and using full sentences. Stimulus fading involves changing one variable at a time to transfer speech from one person, place, or situation to new communication partners, places or during activities in which the child may not currently speak. For example, a fade-in may involve the following sequence: child speaks to a parent while playing a game in the classroom alone, teacher enters room and slowly moves towards the play between child and parent (out of room; sits in room at a distance; moves closer), attends to the play (increases eye contact and watches the game), verbally participates in the interaction (comments on the game, speaking directly to child, asks child force-choice questions), and the parent is slowly faded out of the play and then the room. Fading features essential components from Parent-Child Interaction Therapy (PCIT), which was originally developed to treat childhood disruptive behaviors, has been modified for children with SM (PCIT-SM). PCIT-SM focuses on teaching communication skills to parents, problem solving, consistency and follow-through, and providing positive attention/praise to desired child behaviors. PCIT-SM involves live parent coaching from a trained clinician with the use of an earpiece while the therapist observes the parent-child interaction in a different room. Two phases comprise PCIT-SM: 1) Child Directed Interactions (CDI), and 2) verbal directed interactions (VDI). Exposure therapy utilizes a fear hierarchy, or ladder, to “expose” a child with SM to a variety of situations that require either non-verbal communication or speech, with increasing difficulty levels throughout treatment. The child is then positively rewarded for engaging according to a behavior plan that the provider, parents, child, and when possible, school team members, work on collaboratively. A critical goal and focus throughout treatment is the generalization of speech and social gains to as many individuals, settings, and situations as possible (Raggi, Samson, Loffredo, Felton & Berghorst, 2018). Contingency management uses rewards systems to celebrate brave behaviors and limit attention to problem behaviors. Behavioral intervention is most often provided in individual therapy or group therapy on at least a weekly or almost weekly basis. Children with SM may also participate in intensive therapy camps, such as Brave Buddies, Mighty Mouth, and Confident Kids Camp, and typically involves approximately thirty hours of behavioral intervention in one week. SM therapy camps are often held in simulated classroom environments and provide field trip activities such as scavenger hunts and visits to local restaurants. Although selective serotonin reuptake inhibitors (SSRIs; e.g., Prozac, Zoloft) are common medical treatments for anxiety and mood disorders, there is limited research in the use of these medications for selective mutism; however, the limited data have shown promising results, especially for children who do not respond to psychological/behavioral interventions (Carlson, Mitchell, & Segool, 2008). The role of pharmacological methods in the treatment of SM is largely unknown as there are few large-scale experimental pharmacology trials. Most of the research available on medication and SM are based on small samples; however, a recent review pointed to Selective Serotonin Reuptake Inhibitors (SSRIs) as the most promising medication treatment option for children with SM (Carlson, Mitchell & Segool, 2008). Generally speaking, medication is used as a secondary means of SM treatment if children are not responsive to behavioral therapy. In addition to poor behavioral therapy response, medication may also be indicated when children have severe SM impairment, comorbidities, and/or a strong family history of SM or anxiety. When medication is utilized, the goal is short-term use in conjunction with behavioral intervention. Currently there are no medications with FDA approval for the specific treatment of SM. It is important to take note of potential side effects when considering utilizing medication in the treatment of childhood SM. SM affects approximately 1% of the general population (APA, 2013; Bergman, 2012). <="" a=""> Despite being considered a rare condition, these prevalence rates are similar to, or greater than, those documented for autism spectrum disorders. SM is an early onset disorder and commonly begins in children approximately ages 2.5 - 4 years old. Children with SM are often identified at ages 5-6 years, reflecting a 1-3 year gap between onset of symptoms and identification (Kotrba, 2015). Formal assessment and treatment for SM typically occurs at ages 6.5-9 years, which coincides with 4 years in school (Kotrba, 2015). These delays can lead to a more ingrained set of rules for (non)speaking, and place children at risk for being labeled as the ‘one who does not speak,’ as well as for a continued diagnosis of SM in adolescence and adulthood. SM is more common among female than male children, an almost 2:1 ratio (Kumpulainen, 2002; Garcia 2004). The difference between male and female children may reflect an accurate picture, or may reflect bias by social expectations for females to engage in more verbal communication, leading to greater awareness and concern when they do not. At their core, anxiety disorders feature fear, anxiety, and related behavioral factors. It would then make sense that a child with SM who exhibits fear and anxiety about speaking may also experience fear and anxiety in other situations. Children with SM may experience anxiety in social situations, difficulty separating from parents, and fear of specific objects or situations (e.g., bees, the dark), which can result in additional mental health diagnoses. Children with SM may therefore be diagnosed with other anxiety disorders such as social anxiety disorder, separation anxiety disorder, and specific phobias (APA, 2013). The highest comorbidity rates exist with social anxiety disorder with as many as 75-100% of children with SM also meeting criteria for this disorder (Yeganah, Beidel, Turner, Pina, & Silverman, 2003). Given overlapping symptoms and comorbidities it is important for a clinician to determine if a child’s additional symptoms are due to SM, or if an additional diagnosis is warranted. SM is also found to be highly comorbid with various communication disorders (APA, 2013). In one study, 32% of children had receptive language difficulties and 66% had deficiencies in expressive language (Klein, Armstrong, Shipon-Blum, 2012). While it is certainly possible for a child to have a communication disorder and SM, an SM diagnosis is not warranted if the lack of speech is directly caused by the communication disorder. There are situations in which these disorders can both be present: for example, if a child does not speak in front of others because of worries about how their communication disorder affects their speech (e.g., “I sound funny”), then a diagnosis of SM may be warranted. As with most psychological disorders, there is no “one cause” for SM. In fact, SM may be due to a combination of temperamental, genetic, environmental, and neurodevelopmental factors (Muris & Ollendick, 2015). Children with SM are often described as being behaviorally inhibited since infancy (Gensthaler et al., 2016). Broadly, anxiety has a strong genetic basis and tends to run in families, with the heritability ranging from 25-50% (Czaijkowski, Roysamb, Reichborn-Kjennerud & Tambs, 2010). Among individuals with SM, 70% have a 1st degree relative with a history of social anxiety disorder, and 37% have a 1st degree relative with a history of SM (Chavira, Shipon-Blum, Hitchcock, Cohan, & Stein, 2007). For children with SM, social interactions or settings where speech is expected may trigger the fight-flight-freeze response typical of all anxiety disorders. Further, these reactions or behaviors may then be reinforced when children “escape” the fear-inducing situation by not speaking. 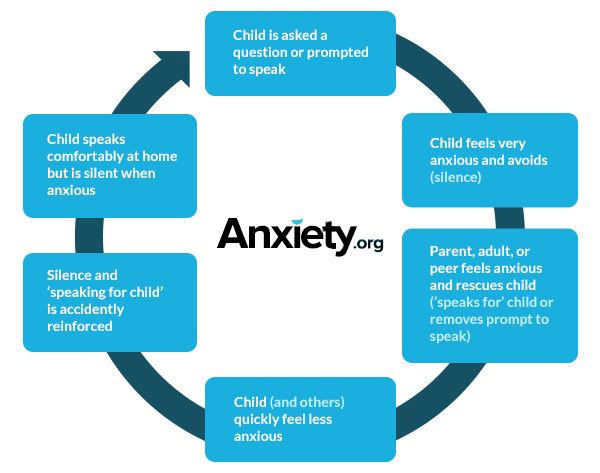 This cycle of avoiding speech and subsequent reductions of anxiety may be viewed as an “effective” avoidance technique (Young, Bunnell & Beidel, 2012). Well-intentioned parents, siblings, and others will often ‘speak for the child’ or remove speaking demands, accidentally reinforcing the child’s silence. See the behavioral conceptualization graphic below. Research also points to possible differences in the transformation and processing of sound as being linked to SM (Henkin & Bar-Haim, 2015; Muris & Ollendick, 2015). Essentially, parts of the brain and ear may cause children with SM to hear their own voice and other sounds differently than typically developing children. Some additional risk factors for children with SM may include family dysfunction, trauma, school environment, bullying, immigrant status, and social/developmental delays (Muris & Ollendick, 2015), but again it is important to note that none of these risk factors are necessarily a “cause” for the development of SM. To date, cultural differences have not been documented in children with SM. However, one important cultural consideration is differentiating between SM and the period of nonverbal communication (or the ‘silent period’) that immigrant children experience when learning the host country’s language. When learning a second language, a child typically moves through four well-established stages: 1) persistent silence when expected to speak in the second language, 2) practicing and repeating words in the second language; 3) a ‘silent period’ of quietly practicing words and phrases in the second language lasting, ranging from weeks to six months; and 4) “going public” with the second language (e.g., Samway and McKeon, 2002). Bilingual immigrant children with SM typically do not progress past stage three, due to worry that they do not speak as well as others, resulting in a prolonged silent period. Symptoms of speaking reluctance might be more evident and persistent in the second language; however, bilingual immigrant children will persistently not speak in situations they are expected to speak, usually affecting both languages. This inability to speak is disproportionate to the child’s language competence and proficiency (Toppelberg & Collins, 2010; Toppelberg, Tabors, Coggins, Lum, & Burger, 2005). Parents, teachers, school counselors, school psychologists, and coaches are key players in helping children overcome their selective mutism. Parents are encouraged to share information about SM to other adults, coaches, and family members their child does not speak to. It is also strongly encouraged that parents collaborate with their child’s school to ensure that behavioral strategies and interventions are delivered consistently at school, at home, and after school activities. If possible, parents should have the child visit the new classroom before the beginning of the school year. The parent should encourage verbal behavior at school so that the child begins to feel comfortable in his/her new environment without the pressure of having other children or adults around. Similarly, have the child meet his/her teacher before the first day of school. The goal is not necessarily to have the child speak to the teacher but should be an opportunity for the child to start feeling comfortable with a new adult. If the child does spontaneously speak, the teacher or the parent should immediately praise the verbal behavior in a simple manner (‘thanks for telling me’) and quickly redirect back to the topic or activity. It is critical that there be ongoing communication between parents and teachers to assess progress and quickly address barriers to goals. If the child is joining a new after school activity, have the child meet the coach/instructor ahead of time. Wait 5-10 seconds. Do not immediately jump in to respond. Give the child an opportunity to respond. Show that you are comfortable with a few seconds of silence. Use forced choice questions (‘is this red, blue, or something else?’) instead of yes/no questions (‘is this red?’) or open-ended questions (‘what color is this?’). Children with SM are likely to respond to yes/no questions by nodding or shaking their heads and freeze in response to open ended questions. Have you received direct training in evidence-based treatment (i.e., cognitive behavioral therapy (CBT) and behavioral approaches) for children with SM? Advanced training may include completion of the Selective Mutism Training Institute (SMTI) through the Selective Mutism Association, or direct training and/or supervision by a known expert in SM (e.g., Steven Kurtz, Child Mind Institute). It can also be helpful to look for providers who treat childhood anxiety using CBT and behavioral approaches, and who have familiarity with SM, as SM is considered an anxiety disorder. If you have not received direct training in evidence-based treatment for SM, are you willing to seek out, and/or participate in, ongoing consultation with a trainer or graduate from SMTI, or other known SM expert, during my child’s treatment? The Selective Mutism Association website lists providers who are members of the Selective Mutism Association and who self-identify as treating providers of SM. These providers may be qualified to provide consultation to a child’s active treatment provider who is skilled in CBT and behavioral techniques for anxiety disorders, but is less familiar with SM. How many children with SM have you treated and what were the outcomes? Keep in mind that only 1 in 5 lay adults have ever heard about SM, and even fewer mental health providers specialize in this area. However, as SM is a form of childhood anxiety, it can also be helpful to look for providers who treat childhood anxiety using CBT or behavioral techniques. Treatment of SM is typically short-term, and lasts months rather than years. Skilled providers typically report that each session targets speaking behaviors and a child with SM verbalizes to them within the first few sessions of treatment. What behavioral techniques do you use to target speech? The most effective behavioral techniques in the treatment of SM include fading, shaping, and exposure therapy (See treatment section of this article). What role do parents, caregivers, and siblings play in the treatment? Naturally, parents and siblings want to help, but sometimes what feels helpful in the moment can accidentally lead to more anxiety in the long run. For example, a well-meaning parent or sibling who sees a child struggle to answer a question posed by a store clerk may answer for that child. While this may break an awkward silence, the child will miss out on the opportunity to be brave. Parent training typically includes education regarding the brave cycle and avoidance cycle, ways to help without falling into common pitfalls, how to reduce accommodating behaviors (i.e., those that enable avoidance/silence), and specific techniques to fade-in new communication partners and in new settings. How do you work with, and within, the school to facilitate speech? The treatment plan can include direct observation of the child in school, coaching staff, and conducting fade-in or shaping sessions in school to increase speech with peers and staff, as well as in small group and whole class settings (See the Tips for Parents and Teachers section of this article). How do you help children with SM to increase their speech outside of the therapy appointments, including in their daily activities and during things they want or need to do? Exposures can be conducted in the community, and in common areas where kids with SM typically need additional support, such as ordering food at a restaurant, asking a peer to play at the park, and telling a librarian what type of book a child is looking for. Carlson, J. S., Mitchell, A. D., & Segool, N. (2008). The current state of empirical support for the pharmacological treatment of selective mutism. School Psychology Quarterly, 23(3), 354. Chavira, D. A., Shipon-Blum, E., Hitchcock, C., Cohan, S., & Stein, M. B. (2007). Selective mutism and social anxiety disorder: all in the family?. Journal of the American Academy of Child & Adolescent Psychiatry, 46(11), 1464-1472. Gensthaler, A., Khalaf, S., Ligges, M., Kaess, M., Freitag, C. M., & Schwenck, C. (2016). Selective mutism and temperament: the silence and behavioral inhibition to the unfamiliar. European child & adolescent psychiatry, 25(10), 1113-1120. Klein, E. R., Armstrong, S. L., & Shipon-Blum, E. (2013). Assessing spoken language competence in children with selective mutism: Using parents as test presenters. Communication Disorders Quarterly, 34(3), 184-195. Kotrba, A. (2015). Selective mutism: An assessment and intervention guide for therapists, educators & parents. Pesi Publishing & Media. Kumpulainen, K. (2002). Phenomenology and treatment of selective mutism. CNS drugs, 16(3), 175-180. Raggi, V. L., Samson, J. G., Felton, J. W., Loffredo, H. R., & Berghorst, L. H. (2018). Exposure Therapy for Treating Anxiety in Children and Adolescents: A Comprehensive Guide. New Harbinger Publications. Samway, K.D., Mckeon. D. (2002) Myths about acquiring a second language. In: Miller Power B, Hubbard RS., editors. Language Development: A Reader for Teachers. 2. Englewood Cliffs, NJ: Prentice Hall, pp. 62–68. Toppelberg, C. O., & Collins, B. A. (2010). Language, culture, and adaptation in immigrant children. Child and Adolescent Psychiatric Clinics, 19(4), 697-717. Toppelberg, C. O., Tabors, P., Coggins, A., Lum, K., Burger, C., & Jellinek, M. S. (2005). Differential diagnosis of selective mutism in bilingual children. Journal of the American Academy of Child & Adolescent Psychiatry, 44(6), 592-595. Wong, P. (2010). Selective Mutism: A review of etiology, comorbidities, and treatment. Psychiatry, 7(3), 23-31. Yeganeh, R., Beidel, D. C., Turner, S. M., Pina, A. A., & Silverman, W. K. (2003). Clinical distinctions between selective mutism and social phobia: an investigation of childhood psychopathology. Journal of the American Academy of Child & Adolescent Psychiatry, 42(9), 1069-1075.